Otitis externa, inflammation of the external ear canal, with or without middle ear involvement, is very common in dogs and quite common in cats. Many different factors can cause or exacerbate otitis and recognition and correction of these is the key to successful management. Scrupulous note of the historical features, thorough examination of the ear and collection of appropriate samples constitute the minimum database. 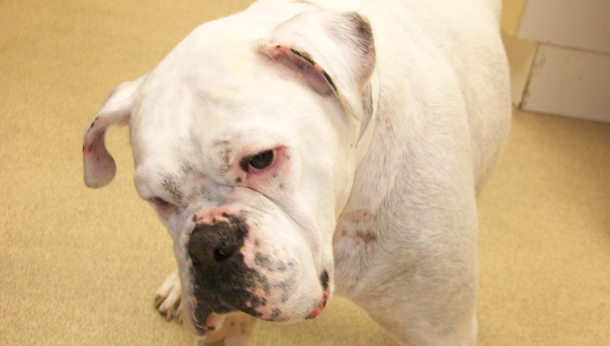 Selected cases may need further investigations, including imaging of the middle ear. Full general and dermatological examination is paramount. This enables to identify underlying primary causes of the otitis and eventual neurological signs of otitis media and otitis interna. In many cases complete otoscopic examination may be impaired by exudate, stenosis, and excess of hair. If otoscopy is prevented by these findings, is preferable not persist (especially in animals with painful ears). Such cases should be examined under sedation/anaesthesia and, in presence of stenosis, is preferable to review the animal after a 1 - 2 week (depending on the severity of the clinical signs) course of oral glucocorticoids. Examination of the visible part of the tympanic membrane may reveal changes (thickening, bulging, loss of transparency, partial rupture) or complete absence. 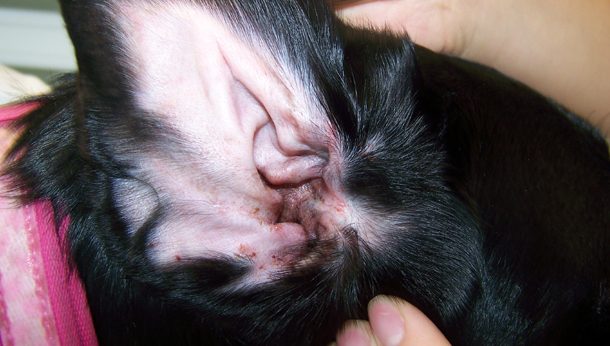 The integrity of the tympanic membrane can also be assessed by tube palpation. This is done through the surgical otoscope head but is more valuable when done through the video otoscope. Debris can often mimic a tympanic membrane; a feeding tube or catheter will, however, pass through into the middle ear without resistance. 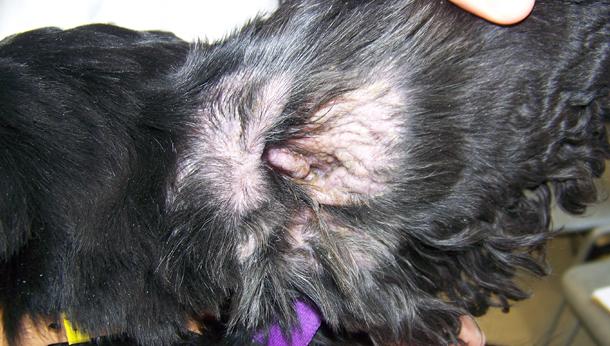 In normal dogs and cats ear the tip of the tube can always be visualised; if the tube tip goes to a point where it cannot be seen that indicates pathology. Another method to assess the tympanic membrane status is by tympanometry. Air is introduced into the ear canal via a closed otoscope. The tympanic membrane should flex back and forth; reduced movement or a bulging membrane suggests that there is fluid or debris in the middle ear. This is difficult technique to perform and assess, and it is not routinely done. The search of parasites (Otodectes cynotis, Demodex spp.) can be performed examined under low power (10x objective) the otic exudate admixed in mineral oil. Cytology is a quick and easy procedure; it is very useful to identify microbes, inflammatory or neoplastic cells and monitor the progress of treatment. Cytology should be performed from both ears in bilateral otitis and from ear canals and middle ear (when otitis media is present or suspected) as the findings may differ and influence your choice of treatment. A swab is inserted into the horizontal ear canal to obtain sample of the otic exudate and then rolled onto a glass microscope slide and stained with a modified Wright’s stain. The specimen is then microscopically examined. It is essential to remember that cytology is most important in identifying micro-organisms, as the discharge does not always reflect the nature of the infection. Ear cytology is necessary at the initial examination and at each re-assessment. Microbial culture and sensitivity from the horizontal canal is not always required. It is performed in chronic recurrent or unresponsive cases, when otitis media is suspected and when rods are seen on cytology; in these cases Pseudomonas is suspected, which may be multi-drug resistant. Studies have shown that the organisms in the external ear canals and middle may be different and/or have different antibiotic sensitivity patterns. If possible, therefore, it is worth taking material for culture from both the external ear canal and middle ear. 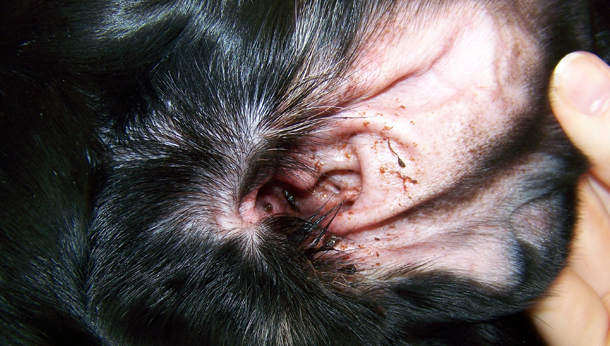 Latrogenic rupture of the tympanic membrane is indicated when otitis media is suspected to take samples for cytology and culture from the tympanic bulla. It should be performed under general anaesthesia and under direct visualization after lavage of the external ear, when the canal is dry. The preferred method used by the author is using a 6 F urinary catheter cut obliquely to a 60° and attached to a 2 ml syringe containing sterile saline solution. The catheter is advanced trough the ventral and posterior quadrant of the membrane with subsequent aspiration of the fluids. An aliquot can be used for direct cytological examination and the remaining for culture. 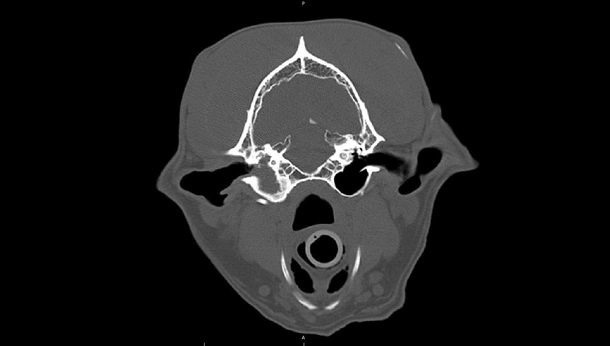 CT – this technique provides excellent images of bony structures and it is also very sensitive and specific for stenosis and occlusion of the ear canals and soft-tissue filling of the middle ear (Fig. 6, courtesy of Livia Benigni). CT, if available, is quick and easy to perform and interpret. However, normal findings do not rule out otitis media. MRI – it provides a better resolution of soft-tissue structures compared to CT or radiography. 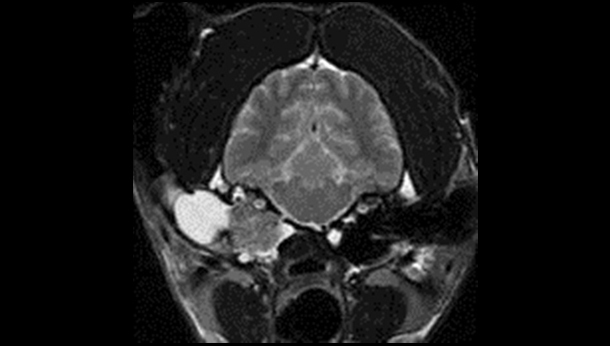 MRI is therefore better for imaging soft-tissue structures such as neoplasia (Fig. 7, courtesy of Ruth Dennis) in or around the ears, but it is less good for imaging and differentiating the cartilage of the ear canal and bony wall of the tympanic membrane. MRI takes longer to perform than CT and is more expensive.